Posted under Health Guides. Updated 4 October 2018. Eczema is a common skin condition that can affect anyone at any age. The only way to tell if you have eczema is to be evaluated by a health care provider. While there is no cure for eczema, there are many treatments to manage symptoms which often include dry, red, scaly and itchy skin. Our skin comes in contact with many different things such as the weather, clothes, soaps and lotions, and a variety of beauty products. Many of us will have a skin rash from time to time, but people with eczema have very sensitive skin and chronic skin problems. Eczema, pronounced “eck-zeh-ma” is a chronic skin condition. The medical word for it is: “atopic dermatitis”. If you have eczema, your skin is likely to feel itchy, red, rough, dry, scaly, and sometimes, it may feel bumpy. It’s not contagious, so others can’t catch it from you. 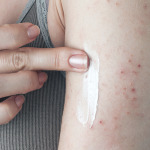 There is no known cause for eczema, but many medical experts believe that a person is more likely to develop eczema if a family member has it or if they have a problem with their immune system (the bodies’ natural defense against disease). If one or both of your parents have eczema, asthma, hay fever, or another allergic condition, you’re at risk for having symptoms too, but your symptoms may be mild, moderate, or severe. Eczema is a common skin condition that can affect anyone, at any age. It most often appears during the first 5 years of life, but it can also start during the teen years or even when you’re an adult. Is there a test for eczema? Unfortunately there’s no test for eczema. The only way to diagnose eczema is by having your health care provider or dermatologist (skin specialist) look at your skin and ask you questions about you and your family’s medical history. While there is no cure for eczema, there are many treatments to help manage the symptoms. Since dry skin leads to itchiness and inflammation, the goal of treatment is to find the best cream or ointment that will keep your skin moisturized (not dry) and lessen inflammation. Although eczema can be uncomfortable, there are things you can do to help your skin feel better. Although eczema can be uncomfortable, there are things you can do to help your skin feel better. Will my eczema ever go away? Most young children who have eczema get better by the time they go to school. Some people may actually outgrow their symptoms during the adult years, but others may have it for the rest of their lives. There’s no way to tell if your eczema will go away completely, but it’s very possible that your symptoms may lessen as you get older. You may have occasional “flare-ups” (times when your skin is particularly sensitive and reacts to things in the environment). Is there anything else I can do to lessen the chance of flare-ups? Yes. Besides following the treatment plan that your health care provider or dermatologist gives you, you can avoid “triggers” or irritants that make your symptoms worse. Too much bathing, showering, or swimming Limit your time in the water. Pat your skin dry and apply moisturizing lotion. Sweating too much Wear clothing made from natural and breathable fabrics such as 100% cotton and avoid getting overheated. Sudden temperature changes, humidity Avoid being outside during extreme weather conditions. Harsh soaps, cosmetics, perfume Use mild soap and hypoallergenic makeup and avoid perfume scented products. Wool or man-made fabrics (polyester) Avoid wearing clothing that irritates your skin. Stick with fabrics such as cotton. Cleaning products Use mild chemical-free cleaning products. Wear gloves when using strong cleaning products. If your symptoms don’t get better with treatment and the above suggestions, your health care provider might do allergy testing to see if something else is causing your eczema. Some people with eczema have allergies to things such as dust, pollen and pets. Camp Discovery (for kids and teens ages 8-16): Under the expert care of dermatologists and nurses, Camp Discovery offers campers the opportunity to spend a week among other young people who have similar skin conditions. There’s no fee; full scholarships, including transportation are generously sponsored by the American Academy of Dermatology.